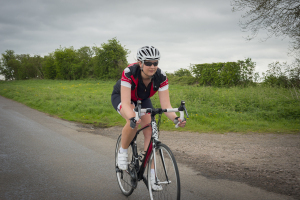 As a female rider, it can sometimes be quite difficult to find kit that both looks the part, is of a reasonable price and that performs well. It’s a difficult call because there seems to be quite a gap for women’s kit between being decked out in pink and purple and being very plain. I don’t want to be riding a flowery bike with matching jersey, shorts and arm warmers. However I am a girl who enjoys cycling and it would be nice to have a better selection of kit available which is possibly a little more suitable, maintaining feminity but without going as far as the floral bike. I’m not totally anti pink and purple by the way! I was quite pleased to come across the Pearl Izumi Elite short sleeve jersey (£59.99, Pearlizumi.co.uk) and matching performance shorts (£69.99, Pearlizumi.co.uk). I went for the red, as the colours are good for visibility and also are matching to my bike, which of course is always a good thing. With summer approaching I just wanted some kit which looked the part and I really liked both the styling and the colours. 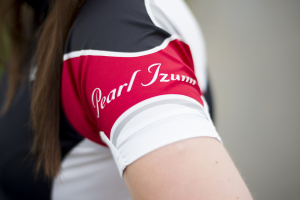 I do like the Pearl Izumi branding, it stands out but it a subtle way. Having ordered these online, it’s always so difficult with the sizing. I do find that cycle wear does tend to come up a little on the small side sometimes, or maybe that’s just what I tell myself! I’m about a size 14 and ordered the large for the jersey and the shorts. The shorts are really comfortable and feel like a second skin. The jersey is also equally as comfortable, its close fitting but not a really clingy material and very breathable. I’m quite tall at 5ft9 and sometimes can find some clothing items to come a little shorter but was really happy with the fit. 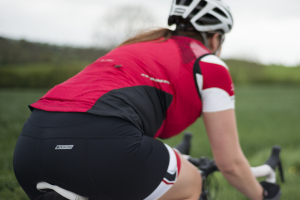 The jersey also has good size pockets which are good to stash for long distance rides. Then for the all-important comfort question and how the pad would serve on a long ride? Well, road tested over a 60 mile ride they didn’t let me down. No uncomfortable rubbing after being on the road for that amount of time. I did also wear this kit when out riding in Italy on some 50-60 mile rides and it was nicely breathable in the hot weather too, and on some bigger climbs. Overall I would recommend the Pearl Izumi Elite range, and will be looking forward to see what is in their new range. A £130 well spent and I would definitely purchase similar products from this brand.